Sri Rama Navami 2018 is on Sunday, 25th March. Sri Rama Navami is the birthday of Rama, the seventh incarnation of Lord Vishnu in human form. It also observed as marriage day of Sri Rama & Sita. In Ayodya, the birth place of Sri Rama, thousands of devotees visit temple to participate in celebrations. A fair will be held in Ayodya. Sri Rama rathayatra is performed in temples. As it is marriage day of Sri Rama and Sita, SitaRama Kalyanotsavam is performed in all temples in Telangana & Andhrapradesh. 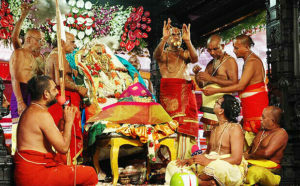 Especially in Bhadrachalam Navarathri brahmotsavas takes place.